Close observation versus upfront treatment in hepatocellular carcinoma: are the exception points worth the risk? Introduction To assess the outcomes of immediate LDT versus observation strategies for T1 hepatocellular carcinoma (HCC) with respect to progression beyond Milan and survival. Method T1 HCCs were retrospectively reviewed from a multidisciplinary tumour board database between September 2007 and May 2015. In the observation group, T1 lesions were observed until the tumour grew to meet T2 criteria (=2 cm). The treatment group consisted of T1 lesions treated at diagnosis with liver directed therapy (LDT). Kaplan-Meier plots were constructed for tumour progression beyond Milan and overall survival. Results 87 patients (observation n=56; LDT n=31) were included in the study. A total of 22% (n=19) of patients progressed beyond Milan with no difference in progression between treatment and observation groups (19% vs 23%, p=0.49). Median time to progression beyond Milan was 16 months. Overall transplantation rate was 22% (observation group n=16; treatment group n=3, p=0.04). Median survival was 55 months with LDT versus 36 months in the observation group (p=0.22). In patients who progressed to T2 (n=60), longer time to T2 progression was a predictor of improved survival (HR=0.94, 95% CI 0.88 to 0.99, p=0.03). Conclusions Immediate LDT of T1 lesions was not associated with increased risk of progression beyond Milan criteria when compared with an observation approach. Longer time to T2 progression was associated with increased survival and may be a surrogate for favourable tumour biology. T2 tumours receive model for end-stage liver disease (MELD) exception points to balance the risk of tumour progression beyond Milan criteria. T1 tumours do not receive exception points given a more indolent growth rate. There is no consensus regarding ideal management strategy of T1 tumours. Allocation policies in patients with hepatocellular carcinoma are evolving towards longer wait list times prior to achieving MELD exceptions. In T1 tumours, there is no difference in progression beyond Milan with immediate liver-directed therapy (LDT) versus observation approach with the goal of transplant listing. In T1 tumours, there was no difference in survival with respect to immediate LDT versus observation approach. Longer time to T2 progression is associated with increased survival. Time to T2 progression is a surrogate for tumour biology. Immediate LDT may be preferred due to evolving organ allocation policies. Most patients with HCC have a low biological model for end-stage liver disease (MELD) score, and consequently MELD does not predict mortality for these patients in the same way it does for decompensated cirrhotics. For these patients, the risk of HCC progression and transplant wait list removal are generally independent of MELD score.2 10 11 To equalise wait list mortality between patients with HCC and decompensated cirrhotics, the Organ Procurement and Transplant Network (OPTN)12 established criteria to award exceptions for transplant candidates with HCC. Based on these criteria, patients with tumours that are >2 cm in diameter and <3 in number (T2 tumours) are granted ‘MELD exception points’ to increase priority for liver transplantation and compensate for their risk of progression and dropout. These criteria are an adaptation of the Milan criteria, which help determine transplant eligibility based on tumour burden, and are defined as one lesion less than 5 cm or three lesions less than 3 cm.1 As such, the current allocation system prioritises liver transplantation for patients with T2 lesions. Given a perceived lower risk of progression,13–15 exception points are not given for tumours <2 cm in diameter (T1 tumours), prompting many centres to observe T1 lesions for progression to T2, rather than treat with immediate liver-directed therapy (LDT). Due to a paucity of data, the ideal management strategy of T1 HCCs remains poorly defined. The two principal strategies for managing T1 HCC are immediate LDT versus observation of T1 tumours until progression to stage T2 (OPTN 5B)12 where patients can be listed for transplant with a MELD exception score. Currently, only limited data have compared observation versus LDT strategies with respect to T1 tumours.16 The aim of this study was to compare the rate of T1 tumour progression beyond Milan criteria in patients treated with immediate LDT to patients who were observed for progression to T2 criteria in anticipation of transplant listing. Patients were divided into two groups for comparison. The observation group included all patients with T1 lesions who were followed up until they met T2 criteria (=2 cm), with the intention of qualifying for MELD exception points for liver transplantation. The treatment group consisted of patients who were treated with LDTs following diagnosis and staging. Variables abstracted from the MDLT registry and electronic medical record included: demographics, aetiology of liver disease, presence and type of treatment modality, laboratory data, MELD and Child scores and comorbid medical issues that would preclude liver transplantation. Tumour characteristics such as tumour stage (including size and number) and LI-RADS classification were also noted. Finally, transplant status, number of patients with progression beyond Milan criteria and times to T2 progression, evolution beyond Milan and death were recorded. To determine times to progression, date of tumour diagnosis on imaging was recorded and compared with the dates for progression beyond Milan criteria, T1 and death. Progression beyond Milan criteria was determined both by notation on the tumour board note as well as confirmed with the date of progression listed on their diagnostic imaging study. The primary endpoint was T1 tumour progression beyond Milan criteria. The secondary endpoint was overall survival. We also assessed predictors of progression beyond Milan and survival. Associations between management strategy and baseline characteristics were summarised and tested using Wilcoxon rank-sum test to compare group differences in continuous variables and Fisher’s exact test for categorical variables. Kaplan-Meier plots were constructed for time to progression beyond Milan and overall survival and compared using the log rank method. Patients were not censored at the time of transplantation. Cox regression models were fitted to identify predictors of progression beyond Milan and overall survival. An alpha error of <0.05 was used to determine significance. All analyses were performed using Statistical Analysis Software (SAS) V.9.4. Between September 2007 and December 2015, 87 patients with T1 lesions were identified. Among these 87 patients, 56 were observed for progression to T2 tumour size, while 31 received LDT. Patients in the LDT group received the following therapies: radio frequency ablation (RFA) (n=3), RFA/transarterial chemoembolisation (TACE) (n=13), TACE (n=13), and TACE/microwave ablation (n=2). LDT and observation groups were compared with respect to demographics, tumour characteristics, MELD score and presence of therapy with no observed differences between groups (table 1). Although body mass index was statistically different between groups, this finding was not clinically significant as both patient populations were obese. In the overall cohort, mean tumour size at presentation was 1.5 cm (range 0.9–1.9) and was not different between groups. MELD scores and alpha-fetoprotein (AFP) were similar between groups with a median MELD of 10–11 (range of 6–29) and median AFP of 8–10 (range 0–6151). Median follow-up period was similar with 33 months for the observation group and 36 months in the treatment group (p=0.99). In the entire cohort, 22% (n=19) of all patients progressed beyond Milan criteria. There was no difference in progression beyond Milan between the LDT and observation groups (19% vs 23%, respectively, p=0.49, figure 1). Overall median time to progression beyond Milan was 16 months. In the observation group, median time to progression beyond Milan was 14 months (n=13) vs 23 months in the LDT group (n=6; p=0.29). Additionally, median survival was 55 months in the treatment group and 36 months in the observation group (p=0.22, figure 2). Progression of T1 tumours beyond Milan criteria over time. Kaplan-Meier plot demonstrating progression beyond Milan criteria in patients with T1 hepatocellular carcinomas who received either upfront liver-directed therapy versus observation until growth to T2 tumour stage and listing for transplantation. There was no significant difference in progression beyond Milan with liver-directed therapy or observation strategy by log rank method (p=0.49). Patients were censored for death. Number of patients remaining after censoring is listed below the x-axis. 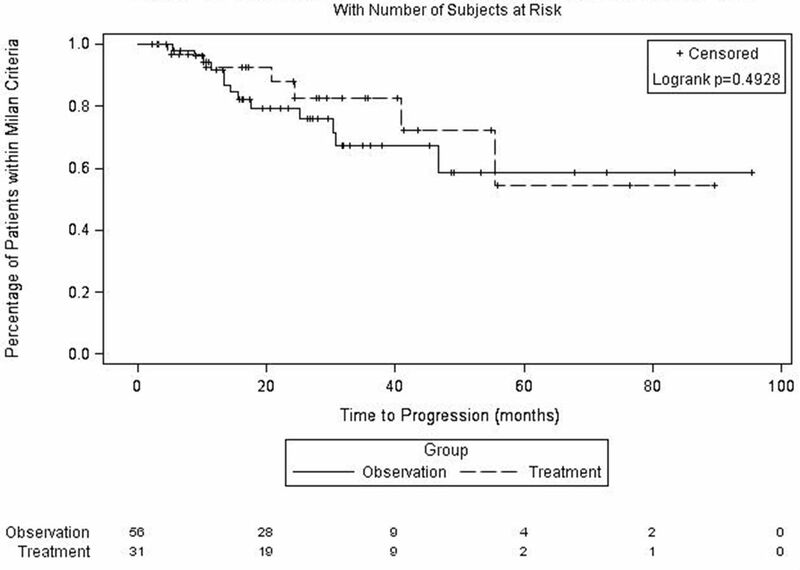 Survival comparison of liver-directed therapy versus observation strategy in patients with T1 tumours. Kaplan-Meier survival comparison of patients with T1 hepatocellular carcinomas receiving upfront liver-directed therapy versus observation until growth to T2 tumour stage and listing for transplantation. There was no significant survival advantage with either strategy by log rank method (p=0.22). Patients were censored at death with the number of patients remaining over time listed below the x-axis by strategy group. Patients were not censored at the time of transplant. Among the entire cohort, 33 patients were wait-listed for transplantation with 30 patients in the observation group and 3 patients in the LDT group. There was no observed wait list drop-off among the patients treated with immediate LDT as opposed to 10 of 30 (33%) patients in the observation group. In the observation group, wait list removal was attributable to HCC progression in six patients, with five of these six patients dying from progressive HCC. Wait list drop-off due to tumour progression was 18% (n=6/33). Ultimately, 19 of 33 (58%) patients received liver transplants; 16 from the observation group and 3 in the treatment group (p=0.04). Post-transplant recurrence-free survival was 94% (n=14/15) with only one death attributed to recurrent HCC. Median survival in the non-transplant patients was 35 months (95% CI 22.1 to 49.6). Predictors of progression beyond Milan as well as overall survival were assessed for the entire cohort including demographics, presence of treatment intervention, tumour size, liver disease aetiology, Child score, MELD score and AFP (table 2). None of these characteristics were significant predictors of progression beyond Milan. In patients who progressed to T2 (n=60), longer time to T2 progression was a predictor of improved survival (adjusted HR=0.94, 95% CI 0.88 to 0.99, p=0.03; table 3). There was no difference in time to T2 progression between LDT and observation groups (7.3 vs 7.8 months, respectively). Finally, as expected, survival was improved in patients who received a liver transplant (HR=0.05, 95% CI 0.01 to 0.40, p=0.004, table 3). In our cohort of consecutive patients with HCC selected from our MDLT registry, we found no difference in progression beyond Milan criteria or overall survival, regardless of whether patients received immediate LDT or were observed for progression to T2 in anticipation of listing for liver transplantation. A total of 22% of patients progressed beyond Milan criteria with a median time to progression beyond Milan of 16 months. Interestingly, although no statistically significant difference in mortality was appreciated between these strategies, survival was approximately 1.5 years longer in the immediate LDT as opposed to observation group (p=0.22). Further, we observed that no patients in the LDT group dropped off the liver transplant wait list, while 18% of the observation patients experienced wait list drop-off due to tumour progression. Finally, increased time to T2 progression was associated with improved survival. Our study noted some interesting findings which warrant further investigation, including a trend towards increased survival in the LDT group as well as increased survival with longer time to T2 progression. Interestingly, patients in the LDT group are living longer than observation patients, and additional larger studies are needed to discern whether early LDT can lead to improved survival benefit by delaying progression times. Time to T2 progression is likely a surrogate for tumour biology with abridged time to T2 progression reflective of more aggressive underlying tumour phenotype. Early LDT can be used to identify high-risk tumours based on response to therapy,18–21 as well as predict the risk of post-transplant recurrence.20 21 Increased risk of microvascular invasion is associated with longer wait list times, suggesting early LDT may also be beneficial in reducing post-transplant recurrence.22 Thus, upfront LDT could be beneficial in predicting tumour biology and identify which patients would receive maximum survival benefit, leading to more equitable organ allocation. In addition to potential survival benefits with LDT, a treatment approach may allow for a more equitable distribution of allografts to non-HCC wait list candidates. It has been well established that the advantage conferred by MELD exception points to patients with HCC sometimes exceeds the survival benefit and can thus disadvantage non-HCC patients waiting for liver transplantation.23 24 As described by Northup et al, patients with HCC often experience both decreased wait list mortality and wait list times; yet, they have higher post-transplant mortality compared with non-HCC candidates, given the high risk of HCC recurrence.24 Consequently, patients with HCC experience less survival benefit post-transplant than non-HCC patients.23 In attempts to address this inequity, the current HCC MELD exception policy has been revised by increasing the wait list time required to gain exception points. Recently, Schlansky et al demonstrated that increased wait list times in patients with HCC predicted longer post-transplant survival, postulating that an observation period after listing may allow us to identify patients with more indolent tumours.23 Similarly, based on our findings that increased time to T2 progression is a surrogate for more favourable tumour biology, we would advocate for using response to early LDT to refine organ allocation and maximise post-transplant survival benefit. Suggesting that T1 disease be treated immediately with LDT would be similar to the suggestion that resection be considered wherever possible prior to transplant. Such a change in the management of T1 HCC is even more apropos given the upcoming changes by United Network for Organ Sharing (UNOS) to further deprioritise HCC compared with decompensated cirrhotics. Aside from ameliorating inequities presented by the MELD exception system, an immediate LDT approach may also provide definitive treatment options in selected patients with HCC, increasing available allografts for non-HCC patients. While transplant is the only definitive therapy for non-HCC patients, some LDTs, such as RFA, can be curative of HCC.25–28 Although recurrence after LDT remains of concern,29 30 close monitoring with salvage liver transplant may be an option in carefully selected patients, as some studies have shown similar overall and tumour-free post-transplant survival compared with those who received an upfront transplant.18 20 31–34 A strategy of early LDT with salvage transplant would allow conservation of grafts and extension of resources to more patients. Finally, only 13%–29% of all patients with HCC ultimately receive a transplant;19 35 36 yet, allocation polices are evolving towards increased wait list times at higher MELD scores, suggesting there may be a growing need for upfront LDT to bridge patients to transplant. As the incidence of HCC continues to rise in the USA, the disparity between available allografts and wait-listed candidates will similarly be expected to increase. Upfront LDT may provide one way to bridge this disparity as we await development of new strategies and refine existing therapies. There are several limitations to the present study. First, generalisability may be influenced by the variance in regional MELD scores. In region 6, our MELD score at transplant is typically in the mid to high 20s which is much lower than more competitive regions such as regions 5 and 9. As such, our wait list time and the number of patients receiving transplants differ and could affect outcomes. Second, our overall rate of progression beyond Milan is slightly higher at 22% than the 10%–15% rate reported in prior studies.13 37 Our marginally higher rate of progression may be attributed to a higher proportion of Child B and C patients, more aggressive tumour biology or our longer follow-up period.19 There was a trend towards more advanced liver disease in the observation group which could introduce selection bias, as these patients may have been too sick for treatment; thus, contributing to the unexpected finding that there was no difference in survival between groups. Our study also presents a small risk of misclassification bias due to the limitations of current radiographic techniques in accurately diagnosing small HCCs.14 38 39 Yet, we expect this bias is minimised by our use of objective LI-RADS criteria and stringent review of indeterminate lesions every 3 months. Finally, our sample size in each study group was relatively limited, but this is typical for studies on HCC therapeutics, as a minority of patients meet criteria for LDT or liver transplantation. Our findings of similar progression beyond Milan irrespective of immediate LDT or observation approach, as well as increased survival with longer time to T2 tumour stage, are supportive of an early LDT strategy. Further investigation with larger prospective studies is merited as early LDT could play an important role in improving organ allocation. Larger studies would also be beneficial to assess whether the trends towards improved survival and decreased progression in the LDT group would reach significance with a larger sample size. Our study holds value as it is the first of its kind comparing various treatment modalities. Taking into account MELD region dependent factors such as wait list time, MELD score at transplant and available treatment expertise, management of T1 HCCs with immediate LDT should be strongly considered. If implemented, this change in management could significantly improve organ allocation. With the current paradigm shifting towards longer wait times for patients with HCC and rising HCC incidence, further studies to use upfront LDT to predict tumour biology and better identify which patients would derive maximal survival benefit from transplantation will be critically important, and eagerly awaited. No personal assistance or reagents.
. 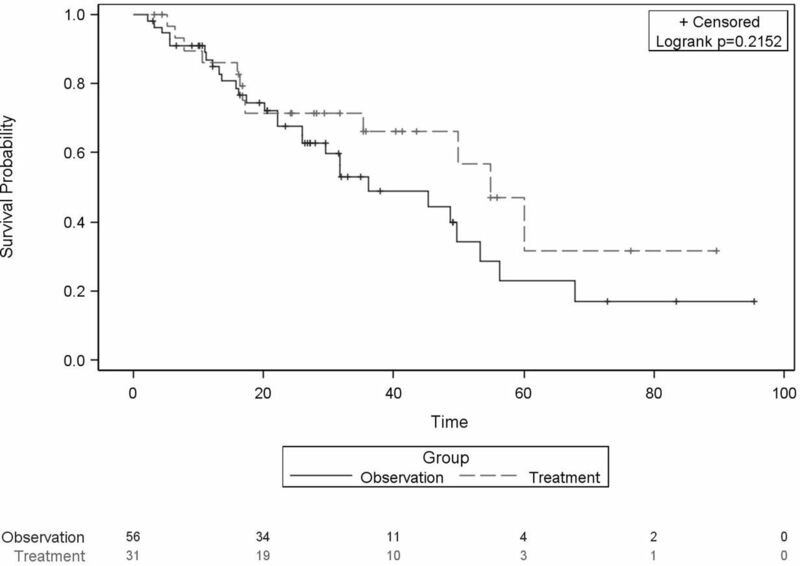 Outcome in patients with small hepatic nodules under evaluation for liver transplantation. Hepatology 2005;42:369A. Contributors DMT, JHJ, CKE and WSN generated the hypothesis and study design with guidance from JA and KF. DMT was the primary author of the manuscript with assistance by BH. Data collection was conducted by BH and DMT. YC conducted the statistical analyses and assisted with revision of the manuscript. JHJ and CKE assisted with study implementation, provided expertise in guiding each stage of the study and revised and edited the manuscript. Manuscript revision and data analysis were also performed by JA, KF, WSN, NN and BS. All authors provided final approval of the article prior to submission. Data sharing statement No additional data are available for this paper.